It's a tight squeeze for public housing in Hong Kong. Photo by Katlin Jackson. A key mantra of sustainable development is the idea that smaller is better. A smaller housing unit requires a smaller initial expenditure of resources and, perhaps more importantly, consumes a smaller quantity of energy throughout its lifespan. Another potential benefit relates to the fact that it simply is not possible to fit as much “stuff” into a small housing unit, which may reduce the impulse to buy it in the first place. Smaller housing units also permit higher residential densities, which reduce the distances that must be traversed for daily activities and enable the provision of efficient mass transportation, thus reducing energy consumption and carbon emissions. I recently visited Hong Kong with a small group of students and real estate professionals associated with the Runstad Center for Real Estate Studies at the University of Washington, with the intent of studying sustainable urban development practices. One aspect of Hong Kong that impressed me immediately was the diminutive size of its housing units relative to their counterparts in the United States. 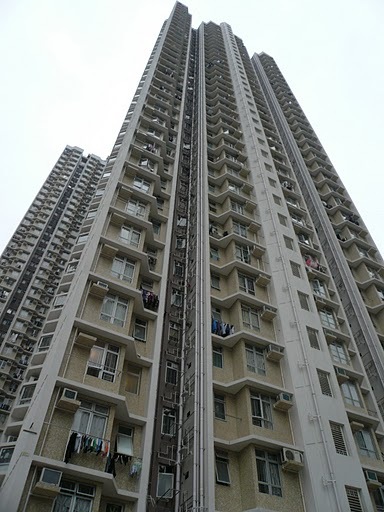 The Ching Ho Estate Housing Tower exemplifies high-rise living with small apartment units. Photo by Mark Huppert. Hong Kong takes smallness to the extreme. It appears to be driven more by high housing costs than by concern for the environment. Most new housing takes the form of high-rise apartment buildings with tiny units. 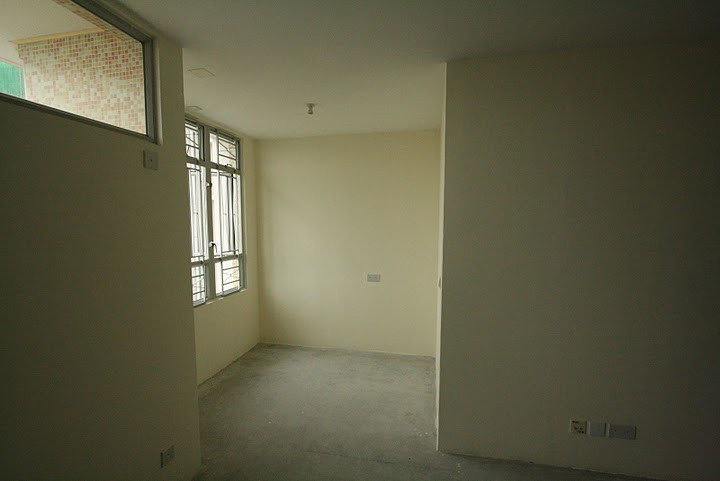 A 430-square-foot apartment in the recently completed Ching Ho Public Housing Estate, for example, was designed to be occupied by a family of five. Ching Ho represents the state-of-the-art in public housing design in Hong Kong, and the 70 square feet per occupant is the most generous allotment yet by the Hong Kong Housing Authority. By comparison, we Americans are veritable space hogs. According to the U.S. Census Bureau, the average size of a new single-family home in the U.S. swelled to more than 2,500 square feet in 2007, although it has dipped slightly in recent years. Average household size in the U.S. is less than three people. Of course, it isn’t entirely fair to compare the size of public housing units in Hong Kong to single-family homes in the U.S., but nearly 40 percent of Hong Kong residents live in some form of public housing, and based on our conversations with locals, it appears that private units typically aren’t much larger. A marketing brochure for a new luxury housing project in the Wan Chai District advertised units ranging in size from 267 to 398 square feet. These units are priced at more than US $1,000,000. While Hong Kong’s diminutive housing units are clearly superior in terms of resource consumption, it is difficult to imagine what it would actually be like to live in a 430-square-foot apartment with five other people. There appears to be no shortage of consumption in Hong Kong, judging from the number of full shopping bags seen on the city’s vibrant streets. With such small homes, one has to assume that Hong Kongers maintain a smaller inventory of personal possessions or use their limited space much more efficiently than the typical American household. Our trip has helped me to better appreciate the spaciousness and affordability of the U.S. housing stock, which contributes greatly to our quality of life. Urban development policy in the U.S. must be careful to preserve the positive aspects of our system while encouraging a more sustainable future. While some reduction in home size is both inevitable and desirable, the potential to attain Hong Kong’s degree of smallness seems limited. Hong Kong-style density is not for everyone and I suspect that most residents themselves would be happier with larger units if they could afford them. Smaller homes are certainly part of the solution, and Hong Kong illustrates that it is possible to maintain a high quality of life while living in housing only a fraction of the size of that found in the U.S. Even a more modest reduction in the size of new homes by one-third could produce substantial benefits. TheCityFix Contributor Christopher Bitter is an assistant professor of urban design and planning at the University of Washington College of Built Environments, and an affiliate fellow of the Runstad Center for Real Estate Studies. The interdisciplinary group of fellows recently returned from a research trip to Hong Kong. Read more about their findings on their blog.